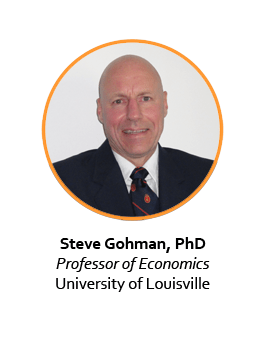 Steve Gohmann has been a faculty member in the Department of Economics in the College of Business at the University of Louisville since 1988. He became the BB&T Professor of Free Enterprise in 2009 and Director of the John H. Schnatter Center for Free Enterprise in 2015. His research focuses on entrepreneurship, health economics, information technology acceptance, and the economics of beer. He typically examines the influence of policy on individual decisions. In entrepreneurship, his studies show that as economies become freer, the types of industries that develop change and the likelihood of entrepreneurship and economic growth increases. The health economics studies examine how various policies affect insurance costs and also the incentives for individuals to obtain treatment for health related problems. Other health economic studies have examined the influence of policymakers’ self-interest on their votes on health issues. The information technology acceptance studies examine how various contractual and organizational incentives affect both the type of system purchased and the extent to which the system will be used. He is a board member of the Association of Private Enterprise Education and on the editorial board of the Journal of Entrepreneurship and Public Policy. His primary teaching responsibilities are managerial economics in the MBA program with emphasis on the economics of strategy. He also teaches a course on capitalism and economic freedom and has previously taught labor economics, health economics, econometrics, mathematical economics, and principles of economics at the undergraduate level and health care economics at the graduate level. He has lectured internationally in Germany, Hong Kong, Korea, China, Singapore, Greece, Russia, and Panama. He is a two time recipient of the College of Business researcher award, has been named the outstanding graduate teaching professor, and received the outstanding overall faculty award. A native of New Albany, Indiana, he received his undergraduate degree in Mathematics and Economics from Indiana University and his PhD in Economics from North Carolina State University. He did post-doctoral work at Duke University.